Staging the dining room before putting your home on the market will make it easier for home buyers to see themselves living and dining in your home. Buyers will be looking for a dining room to accommodate their furniture, lifestyle and all the relatives for big family dinners. Read the home staging tips below to learn how to make your dining room look more spacious, inviting, plus a comfortable place to linger after a meal. Your goal is to make home buyers fall in love with your home, so that you can sell your house fast and for more money! You'll be surprised at the number of people who judge a house by the style of the furnishings within-- they can’t get past it. That’s why proper home staging is so important. Staging the dining room with neutral-colored furniture, draperies, area rugs, etc., will attact a larger audience of buyers, because neutral colors appeal to most people. See staging your furniture for more home design ideas. Once you have decluttered, cleaned, and perhaps painted your dining room, you are ready to start moving your furniture in. If you plan on using an area rug under your table, bring it in first and center it under the chandelier if you have one. Bring in the table first and center it on the area rug. If you don’t have a chandelier, try to place the table in the center of the room. If the dining room is large and oblong, the table may need to go on one end of the room. Balance out the room by placing something of equal "weight" on the opposite side of the room. See space planning for more on visual weight. 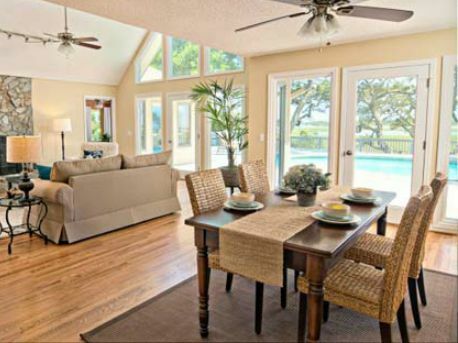 For an open concept dining/living/kitchen home design, place the table under the chandelier. If the chandelier fixture is not in the right spot for the table, watch the video on declutter your dining room to learn how to swag your chandelier to the right spot. 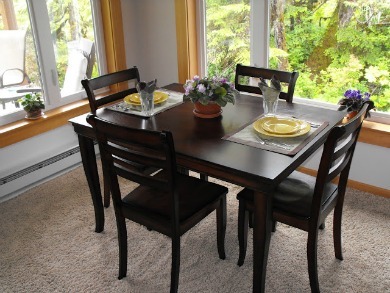 If the dining table is off center, the whole room will look askew. When staging the dining room, edit out more than four dining chairs, unless your dining space is huge. Push the chairs in to create maximum traffic flow around the table. Too many dining chairs will make a room look over-crowded. See small kitchen decorating ideas for tips on making a small space look larger. If your dining chairs have soiled or out-dated fabric cushions, replace them with neutral-colored covers that are solid, a soft geometric pattern or an elegant stripe. Watch the video below to see how easy it is to do it yourself! Video by Sailrite1. If your table doesn't fit or just doesn't look right, try a round dining table instead. A round dining table is often the answer to awkward or small dining spaces. Use a tablecloth in a solid neutral color to hide a less-than-perfect dining table. A tablecloth will immediately change the mood of a room. Vary the colors according to the seasons and holidays. Make sure that the traffic area around the table and chairs is wide enough for two people to walk through at the same time. Move in a buffet table, china hutch, or other large piece of furniture, ONLY if you have the room. Too much furniture in a small dining room will diminish the space. Always remember that you are trying to make rooms look bigger! Install clear light fixtures instead of opaque ones to create long sight lines in a small dining room. Watch this video by John Mangano from HomeStagingChannel for great tips on staging your dining room and setting a beautiful table. Remove or open heavy draperies to let as much natural light as possible into the dining room. 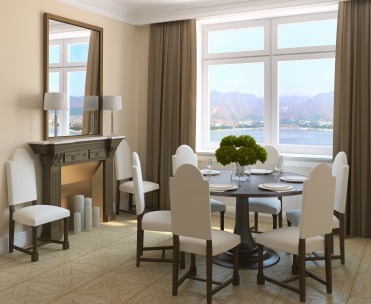 If you have a wall facing a window, hang a mirror on that wall to reflect more natural light into the dining room. Another home staging tip is to lean an oversized floor mirror against a wall or hang multiple ones together to create a light-reflecting feature wall. 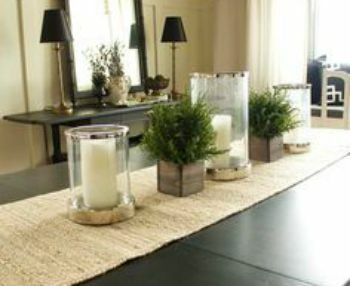 Instead of setting the table, use a table runner and add a centerpiece. Centerpieces can be flowers, a bowl of lemons, limes or oranges for a spot of color, or lay out a simple arrangement of candles down the middle of the table. If you have room in the space for a sideboard or buffet table, hang a framed mirror above it to add visual space and reflect more light around the dining room. Be sure that the mirror is 2/3 to 3/4 the width of the table below and the space between about 10 to 12 inches. Watch the video below for ideas on making attractive arrangements for your dining room or outdoor dining area. Video by PotteryBarn. Place a dramatic arrangement of flowers on a buffet table to add elegance and beauty to the dining room when staging the dining room. Accessories in a china cabinet should match or have something else in common; use solid colors or neutral patterns for accessorizing. Use a contrasting color to the wall, for example, to liven the room up. For open shelving in a small dining room, match accessories to the color of the wall--they will seemingly blend in to the wall, creating the impression of spaciousness. Make a wall grouping with a collection of beautiful plates. Form the grouping into a geometric shape, like a circle or square. See hanging artwork and mirrors for instructions on making wall arrangements. Keep accessories in scale with the room and in proportion with the furniture. Large room, large accessories. A single large accessory, like an oil painting, will create a striking focal point in a small dining room. Follow the home staging advice of HGTV's, Sabrina Soto, who says, "I never like to use things smaller than a grapefruit." Create height by accessorizing shelves with tall objects. If you have a china cabinet with glass doors, display your china or favorite collection inside. Don’t overcrowd the cabinet with every bit of your collection. Instead, place a few of your best pieces, keeping taller objects, like plates, at the back and smaller items in the front. Group like objects together, don’t separate them throughout the cabinet. Don't place doilies on the buffet table or anywhere else. Although beautiful, doilies will instantly date a room. Don’t crowd the dining room with too much furniture. Remove the huge china hutch if it’s dominating the space. 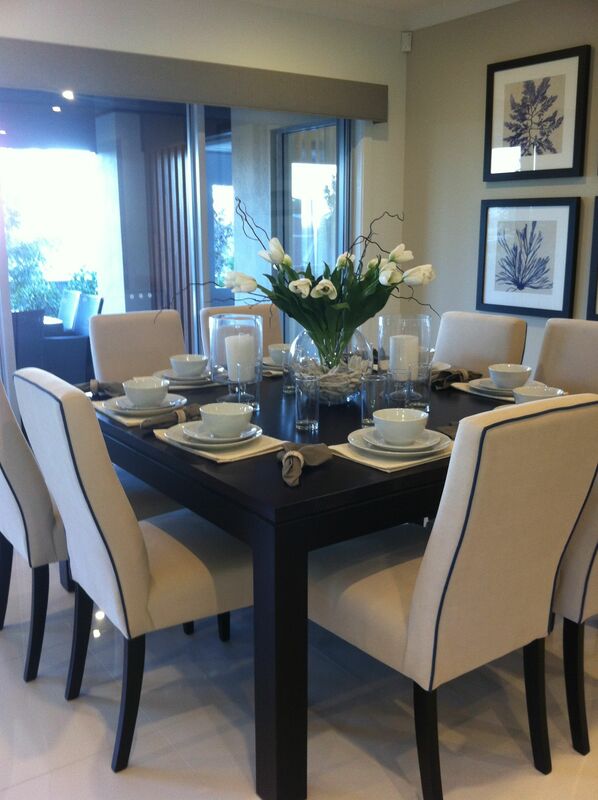 A dining table with chairs and maybe one other piece of furniture is all you need to complete the look. Don’t crowd EVERY ONE of your dining room chairs around the table in the attempt to show buyers how many people can be seated. This will make the room look smaller. Don't stage your china cabinet with a miss-mash of unrelated accessories-- a matching set of dinnerware or pretty pottery will make the room feel more comfortable. Don’t display lots of tiny objects when home staging. Small accessories won't make a bold enough statement and will only look like clutter.